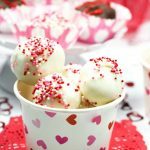 This simple No Bake Oreo Balls recipe makes an easy and delicious dessert. Place Oreo Cookies in a plastic bag and crumble. Pour crushed Oreos into a large mixing bowl with softened cream cheese and mix together well. Place cookie dough in freezer for 15 minutes. Remove dough from freezer and roll into balls. Place Oreo balls on a cookie sheet lined with parchment paper, freeze for at least 30 minutes. In a saucepan stir together the white chocolate and vegetable shortening. Cook on low heat, stirring until both are completely melted. Line a second cookie sheet with parchment paper. Remove a few balls (4) from the freezer at a time. Next, stick a toothpick in the center of a cookie ball and dip it in the chocolate. Shake off excess chocolate and place on cookie sheet. Immediately decorate with sprinkles. Repeat until each cookie ball is covered in chocolate and decorated. Place in refrigerator for at least 1 hour. When chocolate is firm store Oreo Balls in the refrigerator in an airtight container. You can also place each ball in a cupcake liner. To decorate the Oreo Balls you could use both frosting and sprinkles. And, dark or milk chocolate can be used instead of the white chocolate baking chips. Also, you can eliminate using the shortening and melt the chocolate in the microwave in a glass dish on 15 second intervals until chocolate is completely melted.